The Balloonbed ready to assemble with shell, pump, and 7 balloons. My wife laughed at it. My kids giggled. Another Backpacking Light editor (whose identity I’ve sworn to protect) even amusedly called it "hilarious." However, I like the Balloonbed. What other product gives you a two-inch thick sleeping pad for under three ounces? If your hiking partners tease you about it, just stare them down while wearing a balloon-animal hat! Packed up, the Balloonbed is about the same size as a cook pot made from a 24 ounce beverage can. Setting up the Balloonbed is straightforward. With a little practice, each balloon can be pumped up in less than a minute, though if you’re too enthusiastic, it’s possible to overinflate them so they’re too long for the shell and difficult to tie off. A couple of practice balloons are advised to achieve just the right size. Tying them off is probably the hardest part – especially if you have cold fingers. It helps if you pinch the balloon near the opening while inflating. This leaves a short, uninflated section that is easier to tie into a knot. To pack up the Balloonbed, pop each balloon with the included brass safety pin, stow the used balloons so they can be packed out and discarded, and roll up the shell into the stuffsack. The Balloonbed pump. It takes about 75 pumps to inflate a balloon. The whole pad can be inflated and assembled in about 7 minutes. Comfort is certainly subjective, but I found the Balloonbed to be more comfortable than closed-cell pads such as the Gossamer Gear Nightlight and Therm-a-Rest Ridgerest pads, but less comfortable than a one inch thick self-inflating pad. Two issues affect comfort: First, when inflated to fit the shell, the balloons are much firmer than you’d imagine. Second, there is a space between each balloon that can be a bit uncomfortable depending on your position. I was more comfortable sleeping on my side than sleeping on my back. Of course, both size and firmness are dependent on how much you pump up the balloons. The Balloonbed is significantly warmer when used with a conventional mummy bag rather than a quilt. With a quilt, the space between balloons creates a channel that is susceptible to drafts. Conversely, this same space allows the insulation on the bottom of a mummy bag to loft between the balloons, providing additional warmth. Because the balloons themselves have no internal insulation, they are prone to convective currents and are not very effective insulators. However, the sandwich of the top and bottom shell layers plus the balloons creates a honeycomb of air cells to somewhat break up the convective currents. The end result is that the Balloonbed is warmer than you’d expect, especially when used with a bag containing bottom insulation – just don’t try it on snow. The balloons are actually much more durable than you might think, but they do fail occasionally. I’ve seen three types of balloon failures. The most common is a burst during inflation or insertion into the shell, perhaps due to static electricity. The second is a "bump in the night" from a sharp object (yes, this does get everyone’s attention in camp). The final one is just a slow leak from either a pinhole defect or an improperly tied knot in a balloon that is discovered flat in the morning . If you are using the Balloonbed in a multi-night base camp, most of the balloons will generally stay inflated for several days. A few seem to deflate much sooner – again, perhaps due to pinholes or bad knots. Expect a few failures and bring a few extra balloons. When used on the ground, the pump valve is prone to clogging with debris. I’ve always been able to shake it out without disassembling, but I worry about pump failure. If you have lungs of steel, maybe you could leave the pump at home and save half an ounce. One nice consequence of the modular design with disposable balloons is that a puncture is not catastrophic. Small rips and tears in the shell won’t cause the pad to fail. Popped balloons are easily replaced. Replacement balloons are available from the manufacturer. They are also available at novelty shops and various places online for around $6 per hundred. Balloonbed claims the size 260Q balloons made by Qualatex to be higher quality than the generic variety. The Balloonbed is the most compact sleeping pad commercially available. It’s also the lightest for its thickness, but that’s not what is most unique – come on, how many other pads are made out of balloons? I'm amazed this article didn't generate any debate on a UL backpacking site. I see some improvements I think might be worthy of playing with. The first and most obvious is to make the shell out of lighter material….silk or cuben ala Bill Fornshell. The second is to make the shell 'baffled' like a quilt, with the baffles fitting tightly around the balloons. This would reduce the gaps where drafts sneak in, and may improve the R-Value. The thrid possibility is to tie the balloons so they CAN be re-used. There is a technique involving twisting of the valve instead of tieing a knot that would work, but the balloons would ideally be more robust for this approach! Then I went back to the ballon idea and dyed the white Silk Kilt black. 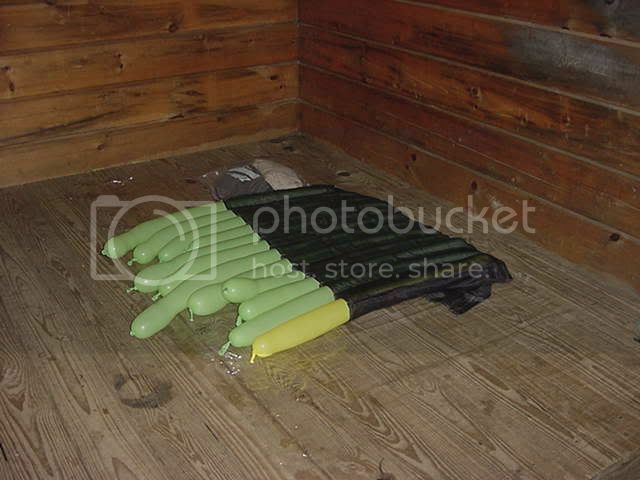 The picture shows it being used at Wood's Hole Shelter on the AT in Georgia, October 2006, as the shell for my balloon bed. The balloon bed is torso length. The Silk Kilt used alone weighs 1.9 ounces. If you are careful you can tie a slip knot on the balloon and use it more than once. This is sort of hard so it you try this carry a few extra balloons. I am only about 50% successful with a slip knot. The balloons alone have about "0" insulation value. I use a self-inflating balloon that weigh about 3 grams each. > I use a self-inflating balloon that weigh about 3 grams each. I am sure we would all love to know how you make a self-inflating balloon! Or do I misunderstand? Perhaps he means he inflates himself (by mouth), rather than using a pump! I imagine this would be quicker than using a pump too. Otherwise I am intrigued….! Clever stuff but it does not look that cumfortable to me!!! Plus who wants to be blowing up balloons after a long day of backpacking. Balloons don't self inflate-right? > I imagine this would be quicker than using a pump too. Depends on the person. I just don't have enough lung power to blow those balloons up… so it's use the little pump or nothing. I wrote a brief balloonbed review around three years ago which come to many of the same conclusions that Carol did. With the advent of the BA clearview and the soon to arrive thermarest, I would skip the balloonbed. Self-inflating – I should have said self-inflated. Anyway it means that I inflate them and don't use a balloon pump. All I will say about the balloon bed idea is that if you can blow up your own balloons and are only out for a few days at the lightest weight you can come up with – then the balloon bed might be worth the trouble. My feelings about the balloon bed lead me to develop the Poly Tube Down Air Mattress. A balloon bed is very light for one night but fragile and not good for longer trips, because the balloons are not really reuseable . I wonder about a similar modular idea using the BPL 2 compartment pillows in a thin cloth or cloth/foam boxwall holder. A spare pillow would give security. That could be warm, comfortable and lighter than thermorests etc.